It seems to happen when you least expect it. You're late for work, forgot your wallet and your air-conditioning just quit. What next? Well you're in the middle of bumper to bumper traffic and your engine coolant temperature gauge slips into the red zone. Your front end is starting to smoke and you feel like giving up! Well the worst thing you can do is to keep driving. If your engine gets hot enough, you could easily end up with a vehicle fire and that's the last thing you need. Do not try and wait until you get to the next garage or make it home. Think of nothing else except getting your vehicle pulled over safely as soon as you can! 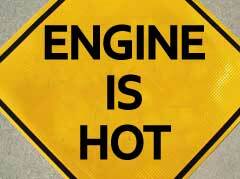 Here are a few pointers if your engine is overheated. If you have roadside assistance, here's a time you can use it. This way you don't have to really think and you can let the experts make your yearly membership fee worth while! In the likelihood that you don't have any roadside assistance, there are a few things you can do if your engine is overheated. When you change your oil, making sure you've got a good funnel, along with a bucket and some cloths, is a good thing. Oil changes are easy but if you don't have all the right tools and the proper know-how, you are going to end up spending extra money to have a garage do it for you. Funnels are important to ensure things don't get filled too much. You can also use it to top up your windshield washer fluid among other things. NEVER attempt to lift the hood if their is steam pouring out. Yah, they do it in the movies but that doesn't mean you should! Wait patiently until there is no steam or engine oil seeping out before you lift it up. TIP: When the engine is hot, don't open the radiator cap. I learned the hard way that you can get a serious burn from pressurized hot water. Lucky for me I only got a little on my hands but I can tell you it wasn't fun. Be safe and just leave the cap on! Have a look to see if your engine cooling fan is running. If it's not, you're going to need a tow to your mechanic to have a look at. It may be a bit of a waiting game but after the engine cools down, have a look and see if the coolant level on the reservoir is low and if it is, you'll need to add coolant. Keep in mind that if it's hot out, you vehicle may have just overworked and hence overheated. If this is the case, you can just let your engine run on fast speed until you get a normal temperature again. You will want you mechanic to have a look regardless, just to make sure there aren't any other issues with your vehicle. One way to cool your engine down yourself is to open the bonnet IF you know what you're doing. Again, you need to be very careful doing this. Or you can try turning the heat up full blast because this will remove the heat from the engine. I hope you've got a good book to read, as this can take a while. If you've got a water bottle in the car, you may be in luck! In an emergency, water will work instead of coolant in the rad. When the engine is cool, remove the radiator cap with a shirt or rag and poor the water in. This should get you to your mechanics or home. Make sure you only drive if the temperature is out of the danger zone! If the engine still isn't cooling enough, you are going to have to break down and get a tow to the garage. Unless of course you have no value for your life and your car is a piece of crap! On second thought, even if that's the case, you still better just call for a tow!